Washi is a style of paper that was developed in Japan after being brought over from China in ancient times. Washi size is generally determined by the sizes of the “sukisu” and “keta” tools used to strain the paper. As individual strainers make modifications to their tools and sometimes have these items built to order, however, there is no such thing as a “standard” sukisu or keta size. This means that there are many different sizes of washi paper available today. The full-sheet (base) washi size generally corresponds to the size of a strained, undressed sheet. 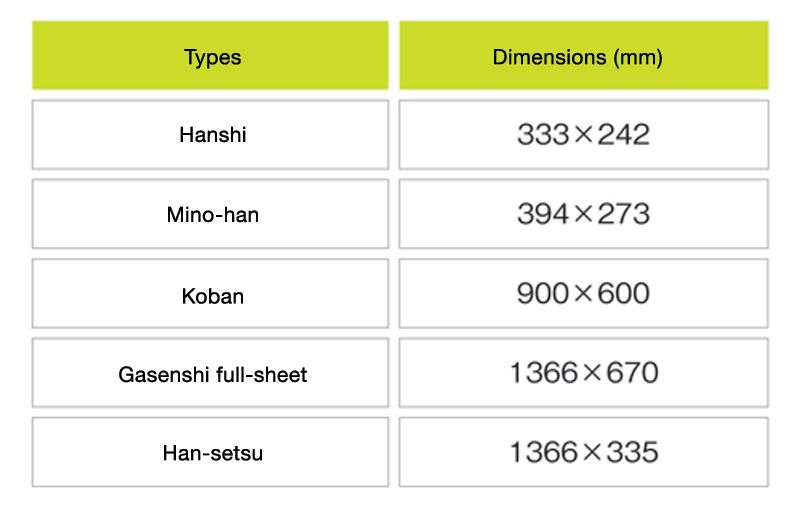 The “kiri,” “sai,” and “ori” units are differently sized cuts of the full-sheet size. Size names like “3-6 (sanroku-ban)” and “4-6 (shiroku-ban)” indicate the length of the short side of the paper (the first number) and the long side of the paper (the second number) in shaku (1 shaku = 30.3 cm). The “ear” (deckle-edge) of a sheet of washi is the part that a papermaker cuts off the sheet during the paper-forming process. Papermakers produce “hanshi” (literally “half paper”), which includes the large hanshi and small hanshi types, by cutting sheets of washi in half the short way. Today, hanshi is often used for calligraphy paper and other similar applications. Mino washi, believed to have been the official paper for the Tokugawa Gosanke during the Edo Period, has different size specifications. 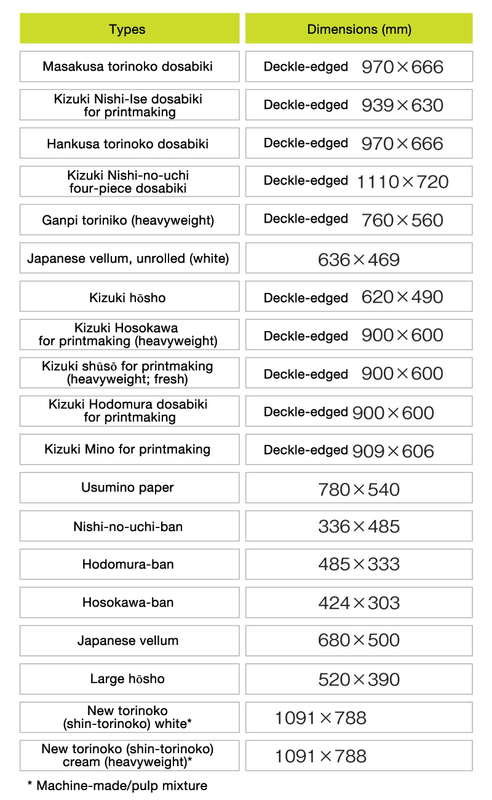 “Mino-ban”—full-sheet size of Mino washi—is slightly larger than hanshi. “Koban” refers to all sizes smaller than the strained base paper, regardless of type or area of production. 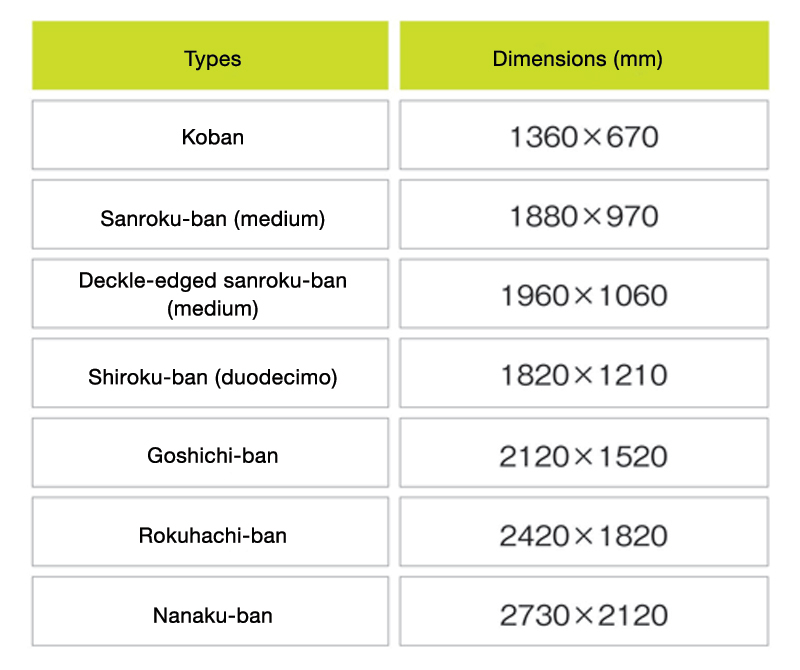 Given this considerable range, there are no set koban size specifications. “Gasenshi,” another type of paper, comes in three main types: small gasen, medium gasen, and large gasen. In most cases, the full-sheet “gasenshi” size corresponds to a full sheet of “small gasen” paper. The “han-setsu” size refers to the size of a full sheet cut in half the short way.